I have run out of washer fluid umpteen times, until I finally decided enough was enough. So I installed a fluid level switch in the reservoir. This is a reed switch with a magnet on top, and the magnet floats up if there is sufficient fluid. Otherwise, the magnet sinks on the switch, which closes the contact. I wired one end of the switch to ground, and fed the other end through to the instrument cluster, i.e. to the "shift up" lamp (which is unused on my automatic Fiero). If you can manage to remember that "shift up" actually means "fill up" (washer fluid), you can stop right there. But I wanted this to be perfect, so I printed this image on two slides, which proved to be sufficiently black. You can take the image to the left for reference, but you will have to experiment with your printer of choice. First I considered using a monoflop or something like this to prevent short flashes of the lamp, but I chose to use a microcontroller again, because that way I had ultimate flexibility and still a low cost. I chose an Atmel Tiny11 for this purpose, the program is only 70 words long. This device is ideal for this purpose. It is low cost, does not require any external components (oscillator and reset circuit with watchdog are built in), and is small: it comes in an 8 pin DIL package. 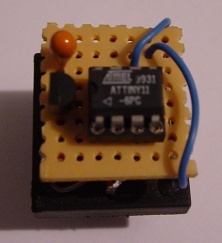 This made it possible to mount the entire circuit in a standard relay housing (see image). The power supply consists of a 1N4148 diode in the 12V line, an 78L05 with two 100nF capacitors from input to ground and output to ground, and a 22uF capacitor from the 5V output to ground. You can see the 78L05 and the 22uF cap on the picture. Everything else is surface mounted, but it's not a lot: a 4k7 resistor from pin 5 to the input (which is switched to ground if the reed contact closes), and a 1k resistor to the base of a standard NPN transistor from pin 7, which drives the lamp circuit from its collector, with the emitter connected to ground. Using a software approach, I was able to incorporate a bulb test, i.e. the lamp lights for four seconds after the ignition comes on. The main part of the software however is to control the lamp. The switch has to remain closed for 15 seconds for the lamp to come on. If the switch opens for more than four seconds, the lamp goes off again. Actually, this is a counter, which counts up 1 for each 1/10 second that the switch is closed, and counts down 4 for each 1/10 second that the switch is open. If the counter hits 0, the lamp goes off, if it exceeds 150, the lamp comes on. The maximum count is 200, i.e. it takes at most 20/4 = 5 seconds of "open switch" for the lamp to go off. If you want to build this circuit, you can email me, and I will send you the binary to program into the CPU.